1.) Create a folder in your root BF42 folder named "ShadowWork". 3.) Put your maps' texture files (Tx01x01.dds etc.) in "Textures" as well as objectlightmaps/terrainlightmaps.con in the map main folder. 4.) Now you have to convert all the dds files into tga so the debugger can work with them, it can't work directly with dds! Now you can decide on how you want this. You can either create batch files (.bat) or simply use modified shortcuts. Procedure is the same really, so I'll go for shortcuts. 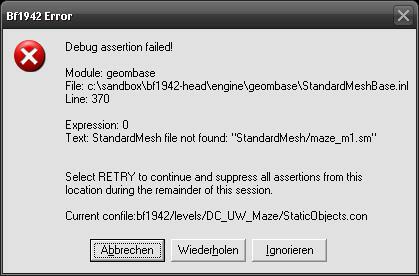 BF1942_r.exe" +game DesertCombat +workingFolder "ShadowWork\" +traceTerrainShadows "bf1942\levels\MAPNAME\" MAPNAME\lmList.dat "ShadowWork\bf1942\levels\MAPNAME\textures"
This line is for generating terrain lightmaps. BF1942 +game DesertCombat +workingFolder "ShadowWork\" +traceObjectShadows "bf1942\levels\MAPNAME\"
BF1942 +game DesertCombat +workingFolder "ShadowWork\" +mergeTerrainShadows "bf1942\levels\MAPNAME\ 1.5 0.6"
There should appear a new subfolder called "merged" with the merged textures. Remember to convert them back to dds to decrease filesize when you pack your map up later. Now you have 3 shortcuts which allow you to quickly generate lightmaps etc. for your maps without ever having to start BC42 . Obviously you always have to edit them for the correct MAPNAME, but that's a matter of seconds. There is a genuine reason why you should use the debugger for packing your .rfa files. It doesn't break them. Every other GUI tool out there destroys parts of .rfa files during packing up. Even the famed WinRFA has a flaw: If you compile your map data with it, it destroys the envmap.rcm and thus you will have NO Envmap effects on your map (the chrome shiny reflections on some weapons&vehicles). And, it's simple and super fast too . The debugger only packs files that are in "Battlefield 1942 (your game root)\bf1942". Same rules as for lightmap generation apply, you have to set them up acording to the BF filepaths. So mapfiles go in "Battlefield 1942\bf1942\levels\MAPNAME\" . Same goes for every other rfa files, just put them in the correct folder . I think the commands are pretty self-explanatory, but ask if you have questions. I have all this awesome knowledge from "Apache Thunder" and only rewrote it to give it a tutorial form . Those are just a few of the harmless screwups from the DC coders (that if DC is the mod your doing this in). Just ignore that error (click retry to ignore further instances of that type of error). Obviously issues with sound files won't effect light map generation. 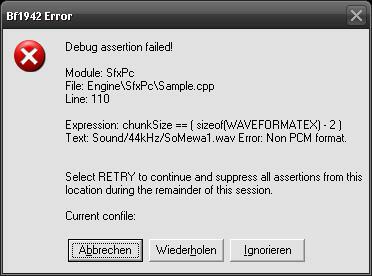 By the way, only the debugger complains about some errors while the retail exe will ignore them. Last edited by Apache Thunder on Sat Dec 12, 2009 12:50 am, edited 4 times in total. At least for every object I made, not the normal custom DC objects from other maps. I stopped the process some seconds later..
Hm, merging lightmaps worked fine for me. Of course I always had to convert to tga first, but then running the merger always gave nice and smooth merged files, no "smurfing" whatsoever...no idea what's causing this. Did you use the retail exe or the debugger for this? (I use debugger for everything ). Oh, and would you head over to viewtopic.php?f=9&t=16 and give my question a look? Senshi wrote: Did you use the retail exe or the debugger for this? (I use debugger for everything ). Or what exactly was your intention? Actually my whole topic was directed at Apache . Which progress exactly doesn't work? Generating object lightmaps? Terrain lightmaps? Or the merging of terrain lightmaps? You are pretty vague about this . If object lightmap generation doesn't work, the reason is simple: You need the .samples files for them so BF can do something with them. And 3dsmax doesn't generate shadow meshes for your custom objects. You need to do that on your own (simply take a LOD03 or LOD04 of your object, copy it and rename it to shadow_OBJECTNAME), then export again with "Use Object names for export", voila, shadow mesh included. Yea, I get an error while creating the object shadows. When I import the model, there is the shadow_maze_m1 . Why isn't there a shadow mesh for all the other vanilla objects when I import the files? 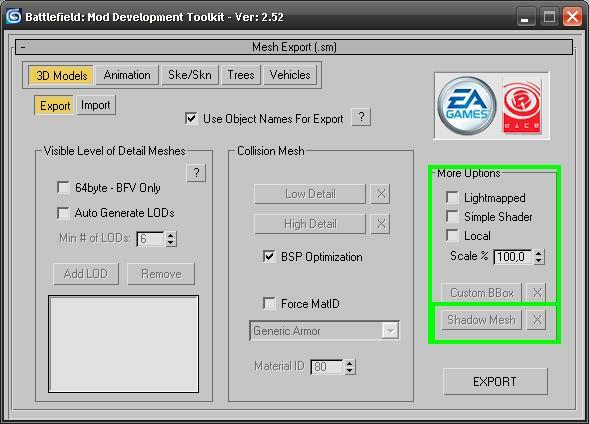 Because statics don't need it, they require the .samples files I spoke of, these have to be in your Battlefield 1942\Standardmesh folder. But I have no idea how to create samples (IIRC there was a tool for that somewhere), never did this myself.